In a few months, millions around the globe will be spectators once again as world renowned young athletes compete at the 2018 Winter Olympics. Not only are individuals competing but so are the countries they represent. Patriotism can unite people, and if what unites us is godly that is good. Recently on the MTV awards, a scantily clad presenter gave a short monologue on the terrible ills in America. Then she yelled to the audience, If we will all just unite against these hateful people…cheers from the crowd…we can overcome racism…louder, longer cheering. She smiled, having just received a better response than previous speech givers. But what kind of country would result from the uniting of those who are just against injustice, even when we all agree injustice is wrong? Uniting around what we are against without a positive replacement of what we are for reminds me of a statement by Jesus. He explained to Pharisees and disciples listening that when an unclean spirit (think of evil actions motivated by racism) leaves a person, it wanders around. But if that spirit comes back, (think of the same person being tempted to act in evil ways again) and his house is empty–nothing positive or good has taken its place–the unclean spirit reenters. Jesus summarized, “The last state of the person is worse than the first” (Matthew 12:43-45). I don’t want a country just empty of evil. I want a country that is filled with love, truth, and the gospel of Jesus! That is what once made America great. But even at our best, our country was nothing compared to the one to come. In that better country there will be no crying, no mourning, no pain, no darkness, and no death! Best of all there will be NO sin nature in anyone, nor will evil be present at all in that better country. We will never again covet or compare. Jealousy, anger, hate, murder, and yes racism, will be no more. Hallelujah! That is a country worth cheering for! -Are you a citizen of this country, this heavenly city? -Are you living on earth as an alien, as an ambassador for the King? -Talk about the differences in your country and the heavenly one. 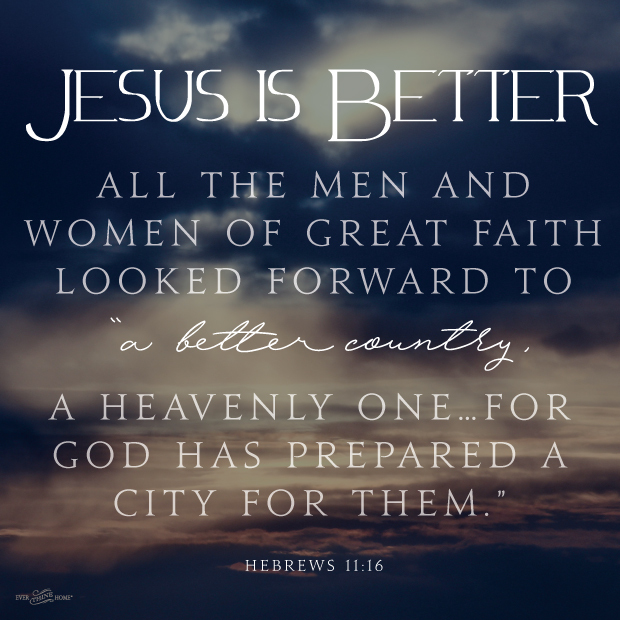 Make a list of all that will be different one day when our citizenship is in Heaven! Thank you. This is timely, I think, as I just decided Friday to not attend a wedding for a friend in Spain because my husband changed his mind about going and told me I could go do what I wanted, but if I went, it would be without his blessing. I’m not sure what that means for someone like me, who was a travel writer pre-children (now 7 and 5), could have used this as a springboard to write about my/our journey and who saw God answer every single prayer I offered to meet every single challenge — childcare, passport renewal, cost for travel with low airfare and low hotel rates, a pastor native to Spain living in the exact area of our wedding destination willing, free and able to point us to inexpensive and reliable accommodations and serve as a travel guide. He also assured me Spain is calm peaceful and secure amid some trouble in the Catalan region where some separatists have organized a referendum on seccession from Spain. When my husband listed his No. 1 barrier to the trip as finances, God even raised up more than one business opportunity for me. One, the bride sent me a job lead, and it would have been tight to be packed, go for a job interview — hopefully secure a job offer to make my husband feel better, drive to Boston to renew my passport and go to Logan to fly out of the country, So I asked to meet a week from Friday, instead. The job guy said we’d do a longer interview and to bring a valid passport or driver’s license and SS card or birth certificate so I could fill out paperwork required to work at the business — it certainly sounds promising, just about all but signed, sealed and delivered! And yet my husband, who told me in June he wanted to go to this wedding, would not even pray with me for God to answer and provide for all our needs for this 2-3 weeks before. He offered a half-hearted prayer the week before, and when God answered the financial prayer with this job tip from the bride, all he could offer was a barb against the employer being liberal. Nevermind the mixed messages and sense of being manipulated and controlled I feel I have received from my husband: How can I go support the marriage of two unbelievers when, in so doing, I’m not going with my husband’s blessing? I have felt regret mixed with moments of peace interspersed with the disappointment, anger and confusion over what has happened. I could have used this boost after the trials and tribulations of the past difficult year. I have heen trying to make sense of it all, why I’d be so stymied in going, when I’ve long desired to visit Spain (having studied Spanish and been the editor of New England’s first Spanish newspaper), and what a beautiful way to seep and steep in the culture than through the wedding of a Spanish bride and her groom, with whom we have shared Christ and the Gospel, and to celebrate in a beautiful setting! After I sat on some steps leading from a school parking lot to a soccer field, where my girls were playing a soccer game yesterday, and shared with a pastor’s wife and asked for prayers for salvation, deliverance and revival for the bride and groom and wedding goers of the Spanish wedding as well as those at the wedding of a friend’s son, closer to home Saturday night, I saw your message come across: A victory like no other. I sure hope my decision to not go was a victory in Jesus because it sure hasn’t felt that way. I sure hope the promise of better country continues to encourage moffer give me peace and hope for the moment because Spain sure looked appealing. The wedding celebration of our friends was a joyous celebration to be sure, and I wish I could have attended — it would have been nice. But I know I can count on the wedding supper of the Lamb to far eclipse anything anyone in this world can offer. Thank you so much for your words of encouragement! I have been thinking lately, pondering over when a man uses an excuse like this to push a woman out of his life. “a girl always wants the bad guy.” “For a woman it’s hard to leave the bad guy” I have been thinking “a bad always wants a or the good girl” that he would go to any lengths to have her and keep her even lie, cheat and steal as a thief to have the good girl. I feel this is similar to immigrants in our country here in the United States of America. Everyone one knows this is the promise land when compared to what they have. Immigrants are lazy because they have not the knowledge or will to remove an from their hearts or perhaps the majority of those countries like sin. And there are few who are against it. In our country we love God it says so even on our money. There are few people here who are against God and we will continue to remain loving God. I see that I need Jesus always. 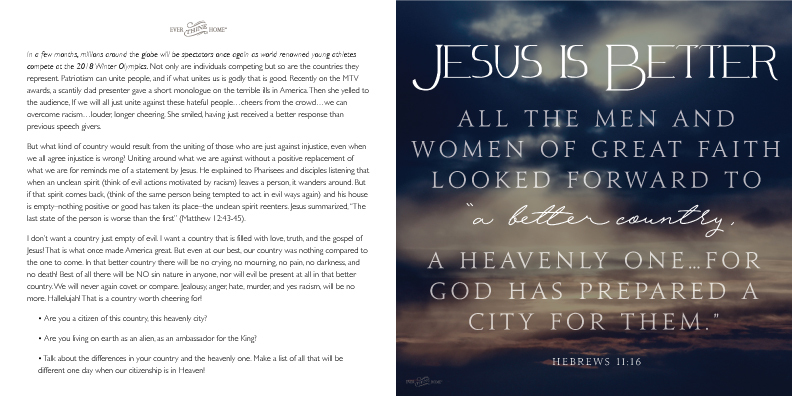 As a female coming from heartbreak I was deceived just as America the name of our country could not keep the bad people out or from doing bad things she just knows that Jesus created her and knows there are men in her country and women who will fight for her Amen. God Bless America the Beautiful and the Brave. To men and women seek Jesus before you do anything all the time, when you can and yes you can. Amen.